Making Tony the director of S.H.I.E.L.D. was such a dumb idea. It really should have been the dumbest of the aftermath of Civil War, but then One More Day came along to redefine worst plot development in a comic book continuity ever. 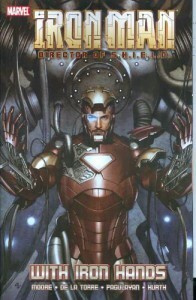 Practically speaking, Tony's director status doesn't have any effect on this story, since he's out in the field Iron Manning the entire time, which is of course what we expect from Iron Man. The twin storylines hit some familiar highlights—Tony feels responsible for accidentally enabling or not being able to non-destructively disarm the villains and angsts about it—but they way they're juggled isn't great. These four issues aren't enough to fill even the slenderest of trades, so they rounded it out with a not particularly interesting and ultimately kinda pointless one-shot from 1998. I guess it is vaguely associated thematically, since it depicts a very chilly working relationship between Iron Man and Nick Fury (who doesn't even know that Iron Man is Tony at this point, so they do the whole you-didn't-tell-Stark-but-now-you-can-tell-me dance). Fury wants Iron Man to do a little underwater salvage work, but refuses to tell him anything about the vessel, which turns out to contain some kind of human/hydra hybrid created by, you guessed it, HYDRA. The HYDRA hydra ends up slipping into a deep ocean trench, where it is presumed dead but actually alive and lurking and presumably plotting. Woo. Not one of Chuck Dixon's best efforts.